Message from Princess Cadence: Okay! We're almost there guys! Are you ready for this?! There's only one more thing you have to do! Click the button 'BLAST OFF' and then you will be able to read more. By a Space Reporter-- Stormtroopers are clearing the dance floor and reports for intergalactic pizza eating contests are pouring in. Some brave heroes are already being rewarded with medals. Awesome! 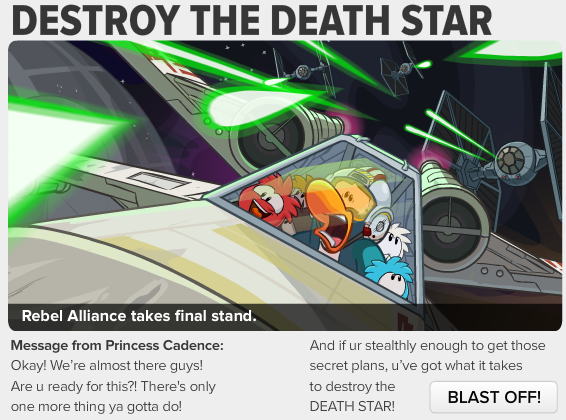 We can finally destroy the Death Star and kick herbert OFF of the island for good! Have you checked out the stage yet? I hear that there's a mystery to be solved having to do with a ruby. 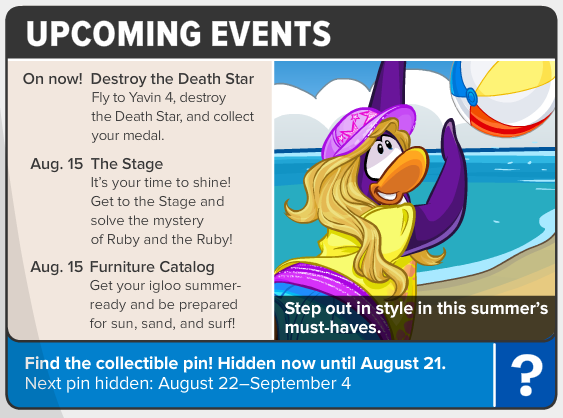 Now we can decorate our igloo with a awesome new furniture catalog!